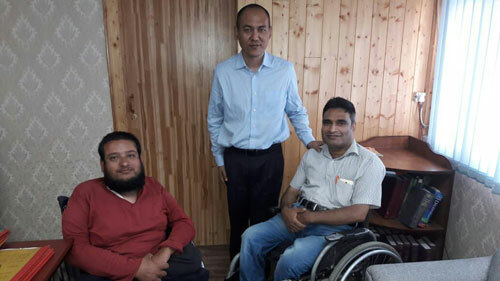 A delegation of persons with disabilities met the Secretary School Education department, Rigzin Samphel , under the chairman Humanity Welfare Organisation HELPline, Javed Ahmad Tak. The meeting was focused on issues faced by children with disabilities of J&K in schools, exams and in accessing school infrastructure. The chairperson described how children with disabilities while enrolled in government schools, like lack of accessible books for blind children, sign language interpretation for deaf and mute children and civilized life activities for children with metal or intellectual disabilities. The provision of ammunisis or writer to children with blindness and upper limb disabilities. Mr. Rigzin Samphel paid full attention towards the issues and listened with concentration. On immediate basis Secretary gave orders for inspection of few schools run by persons with disabilities and where disable children are enrolled and faculty with disabilities are working. Javed Ahmad Tak chairman Humanity welfare organisation Helpline thanked the secretary Mr Samphel for showing super sensitive approach for empowerment of disable people.